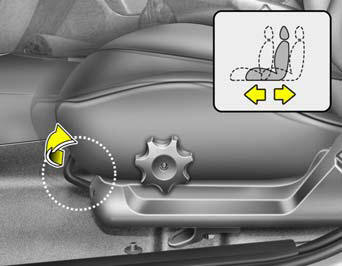 To move the seat toward the front or rear, pull the lock release lever upward. This will release the seat on its track so you can move it forward or rearward to the desired position. When you find the position you want, release the lever and slide the seat forward or rearward on its track until it locks into the desired position and cannot be moved further. After adjusting the seat, always check that it is securely locked into place by attempting to move the seat forward or rearward without using the lock release lever. Sudden or unexpected movement of the driver's seat could cause you to lose control of the vehicle resulting in an accident.